In lieu of conventional white Cauliflower, Cathie brought home a head of green Cauliflower. It was half the size of the white. The florets where obviously in proportion and produced a bowl of attractive miniatures. I would usually just saute them in EVOO and Garlic, but I felt it was too harsh a treatment. 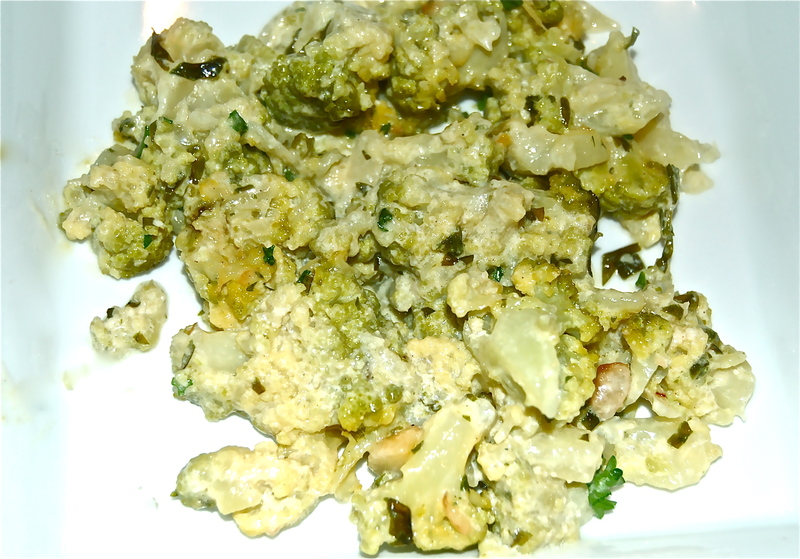 So the Cauliflower was steamed, then sauteed in Butter. Heavy Cream was added and reduced. It was baked in a medium hot oven for a short while. The result was a mild, delicious creamy concoction. 1. Steam the florets for 5 minutes, Immerse in a bowl of cold water, drain & paper towel dry. Set aside. 3. In a deep-sided saute pan, melt the Butter, add the florets & the Salt & pepper. Gently toss to combine & saute for a few minutes. Add the Heavy Cream, reduce until thickened. 4. Place the Cauliflower into a well Buttered casserole dish, & place in the oven for about 10 minutes to completely heat through & the Cream has begun to bubble. 5. Remove & prepare to plate.